No Thanksgiving table is complete without dinner rolls! Most of us treat the dinner rolls as an afterthought. After all, it’s the turkey that’s the real star. So, we buy any old package of generic rolls, throw them in a breadbasket, and pass them around. Most people take one, but not everyone actually eats the whole thing. This year, why not serve dinner rolls that are worth eating? 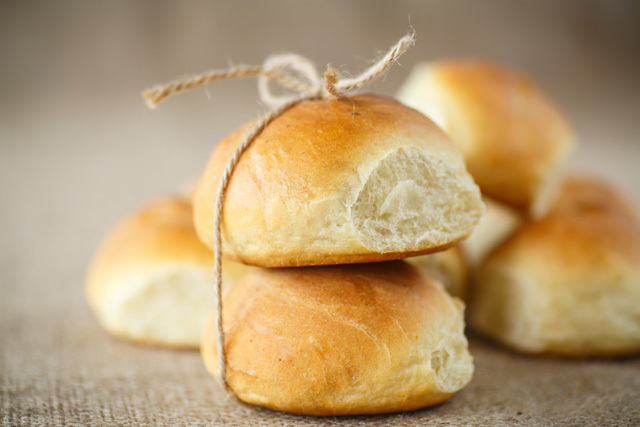 These homemade rolls will have your guests reaching for more! Dissolve yeast into warm water that has been measured to 110 degrees Fahrenheit. Stir in sugar and let stand until the yeast starts to foam. Crack the egg into a small dish and beat it with a fork. Stir in the beaten egg, salt, warm milk, and butter to the yeast and sugar mixture with a wooden spoon. Slowly stir in the flour with a wooden spoon until it gets too difficult. Work the rest of the flour in with your hands until the dough stops sticking to your hands. Spray a large mixing bowl with cooking spray. Add the dough to the bowl and cover it with a large towel. Set it in a warm place and let rise until doubled. This should take about 1 hour. Spray several 6-cup muffin pans with cooking spray. Form dough into 1-inch balls. Place 3 balls in each muffin pan, cover with a towel, and let it rise for an additional 30 minutes. Preheat oven to 425 degrees Fahrenheit. Melt an additional 2 tablespoons of butter in the microwave. Brush each of the rolls with the butter and let stand for about 5 minutes. When oven is preheated, place the muffin pans in the center of the oven (you may have to bake in batches depending on your oven). Bake for 10-15 minutes until the tops are golden brown. This recipe yields 24-30 dinner rolls. If you need to make more than that, resist the urge to double the recipe. Instead, make the rolls one batch at a time. Otherwise, it can be hard to manage the dough in such large quantities. Cinnamon Rolls. Follow the recipe listed above. After the dough rises, punch it down until it deflates. Knead it for about 5 minutes and then roll it flat. Spread the top with butter and sprinkle with sugar and cinnamon. Roll into a tight log and cut the log into 2 inch pieces. Spray a 9 x 13 baking dish with cooking spray and place the cinnamon rolls on the baking dish. Bake for 10-15 minutes in a 400-degree oven. Wheat Rolls. Follow the recipe listed above. However, instead of using 5 cups all purpose flour, use 2.5 cups all purpose flour and 2.5 cups whole wheat flour instead.